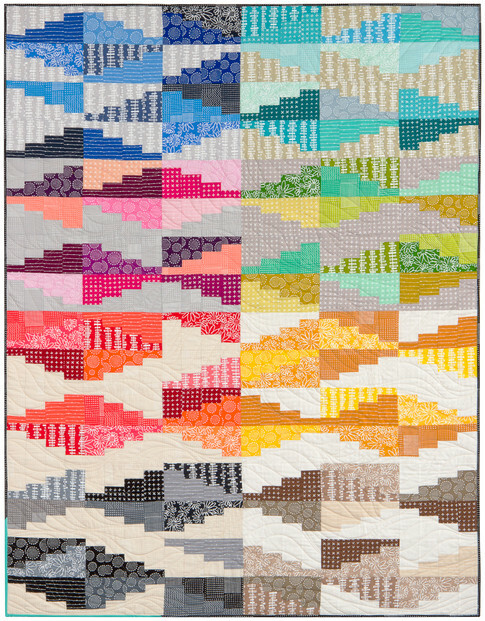 These appliqued silhouettes of women are very cool, with their bright batik hues and cat eye glasses! 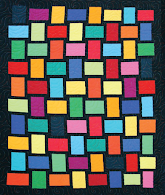 Laurie Ceesay says, "I love portrait quilts and the color wheel so I combined both ideas. 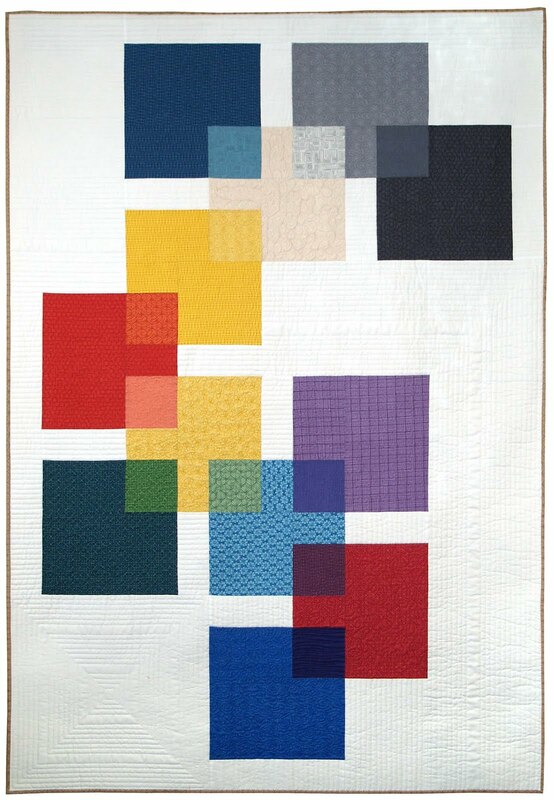 By overlapping the motifs that are in primary and secondary colors, a tertiary color is created. 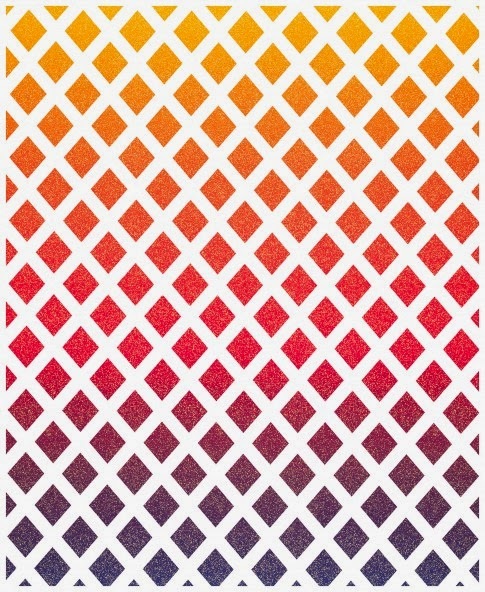 I wear glasses and think they are a fashion statement. 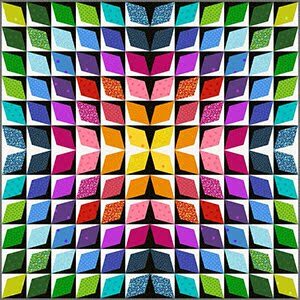 My favorite frame shape is the cat eye... my portrait motifs received cat eye glasses with rhinestone decorations!" 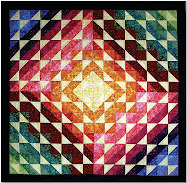 The gorgeous colors drew us to this stained glass quilt. 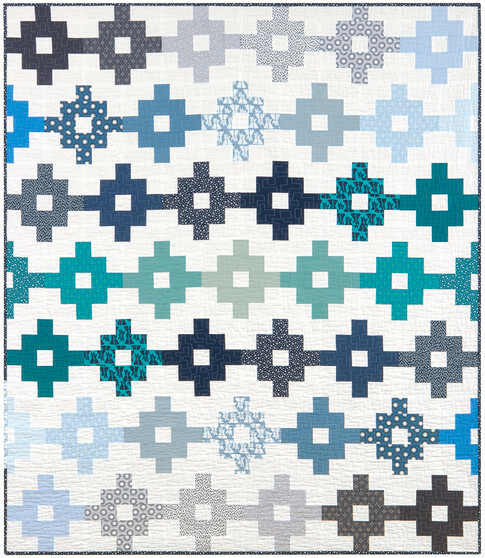 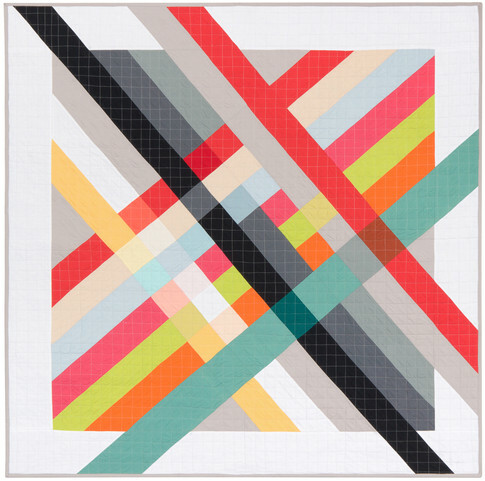 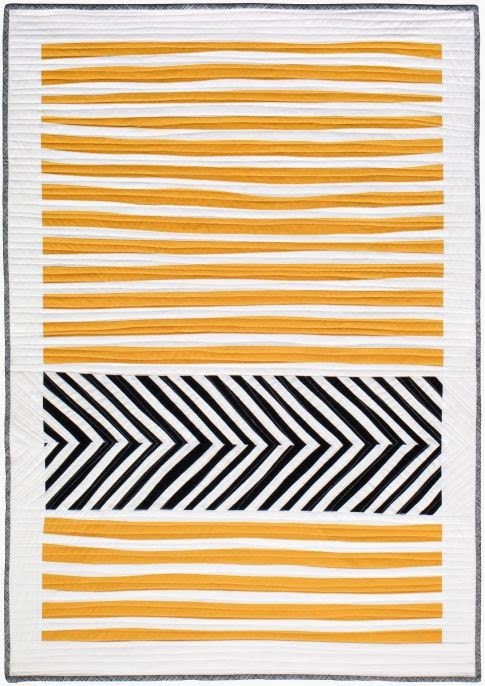 The use of white instead of a traditional black background gives this quilt a very contemporary feel. 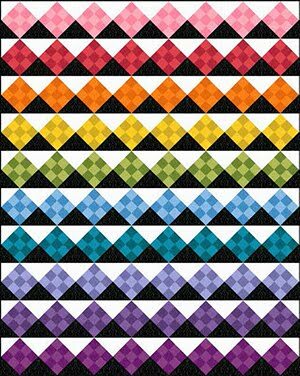 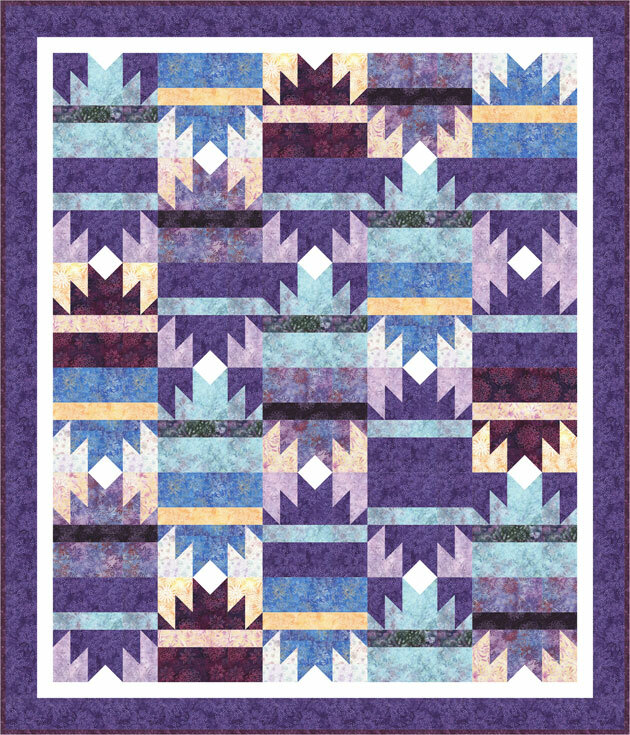 Jeweled Window was based on the Leaded Glass quilt pattern by Tracey Jacobsen, published in American Quilter Magazine, November, 2014 (as of this date, you can still download the free pattern here !) 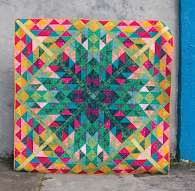 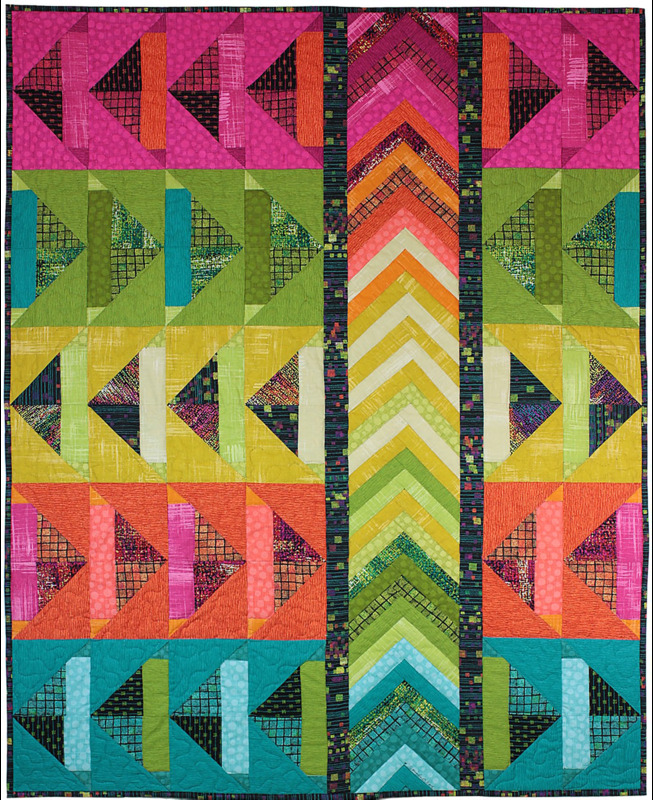 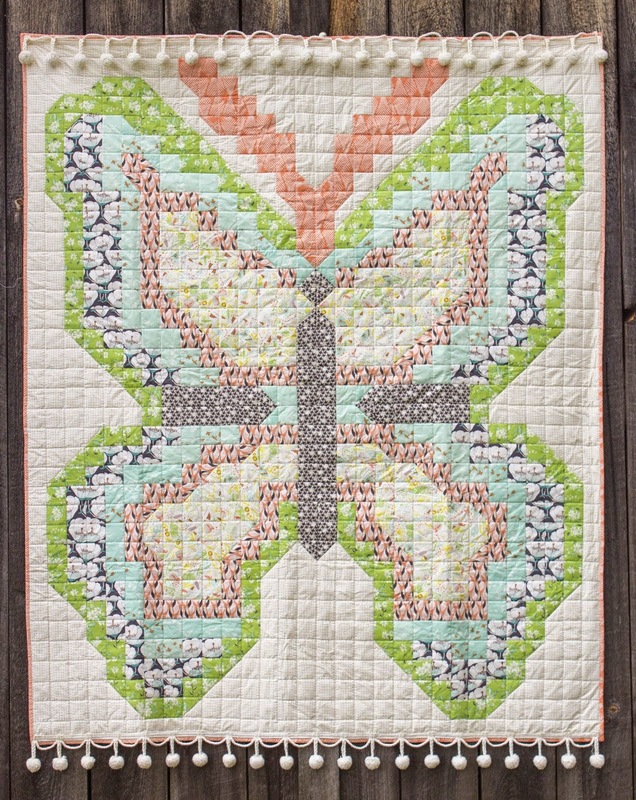 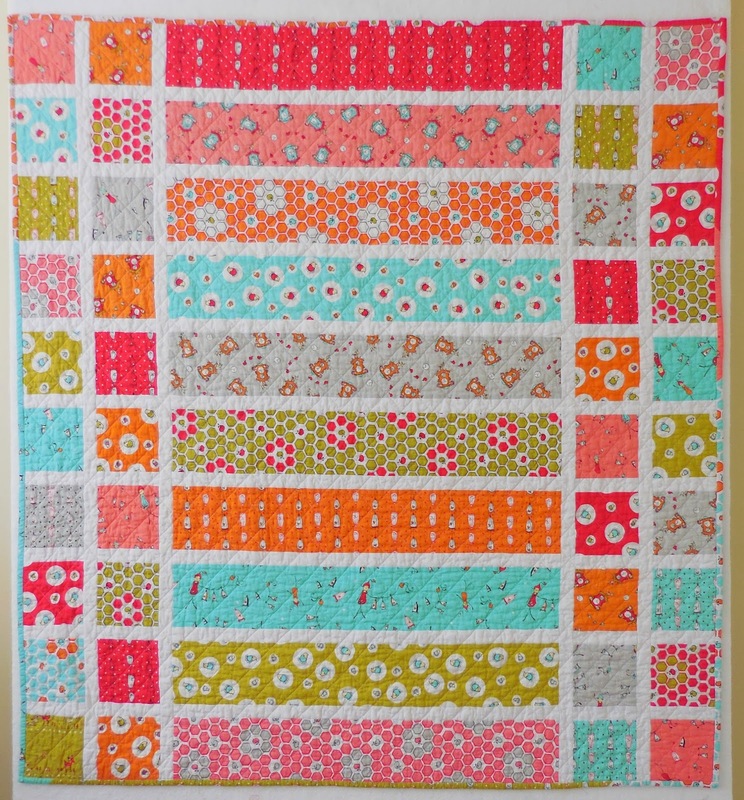 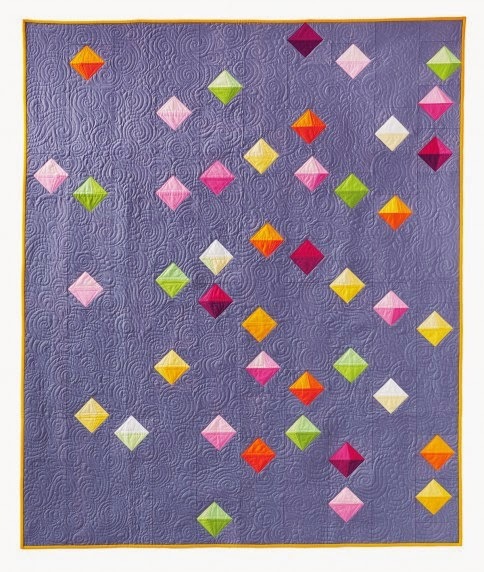 The artist says, "I found this quilt to be the perfect avenue to set off some of the beautiful fabrics in my stash." 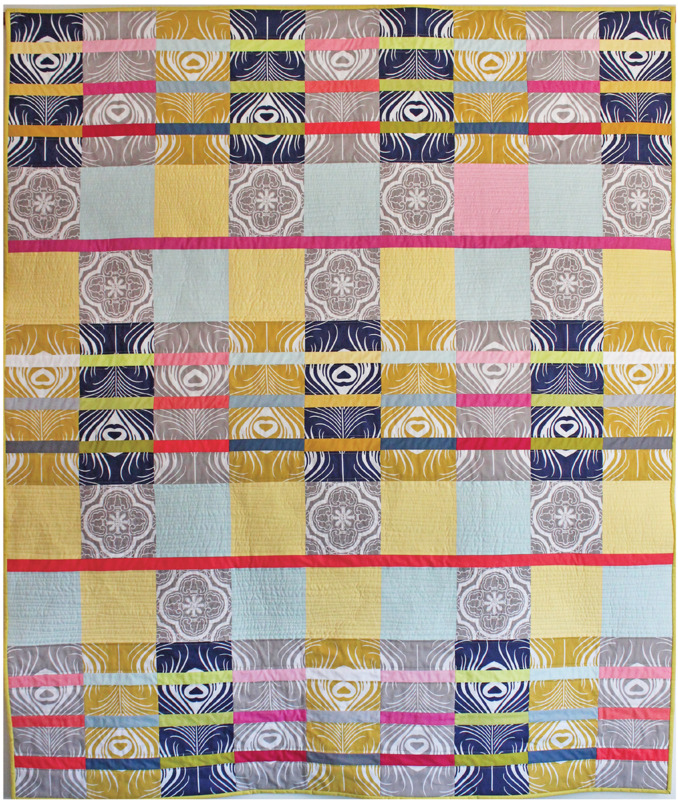 The indigo ombre fabric adds fantastic shadows and lights to this quilt. 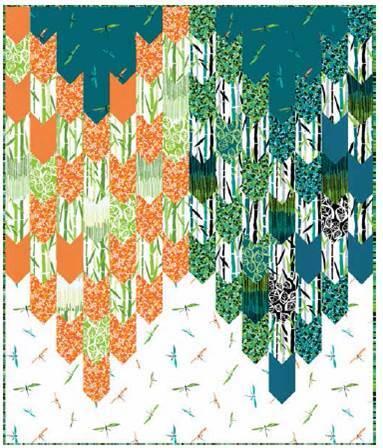 Water Mirror makes reference to water as an architectural element. 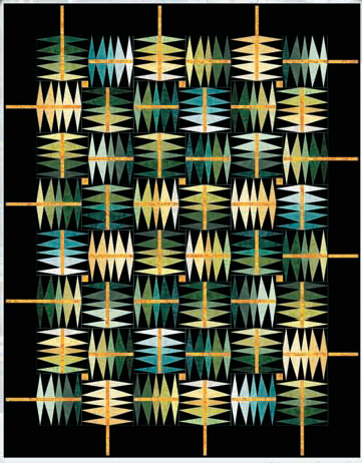 The design was inspired by an iconic mosaic panel by Brazilian artist Athos Bulcão who collaborated with Oscar Niemeyer in the 1960s. 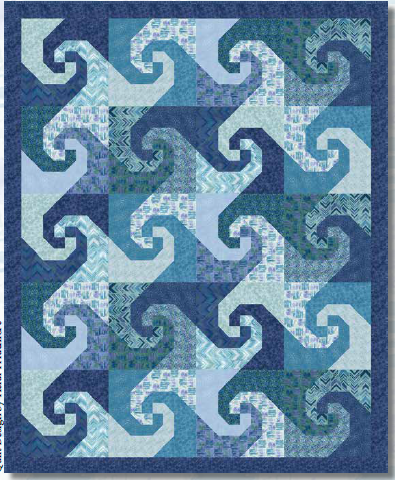 The free-motion quilting reproduces the wind movement across the water's surface, with curves and bubbles playing with the regular solid shapes. 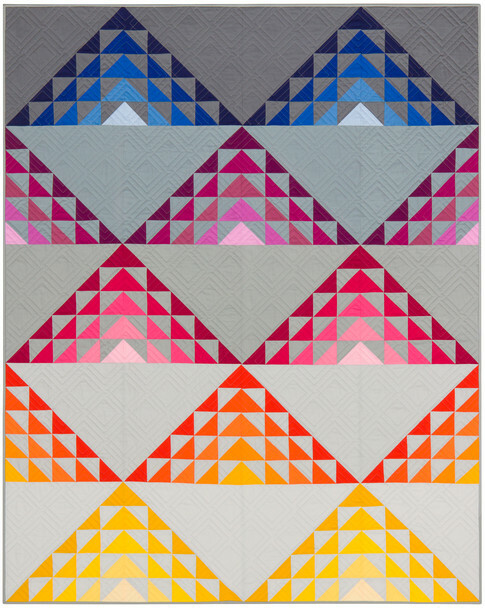 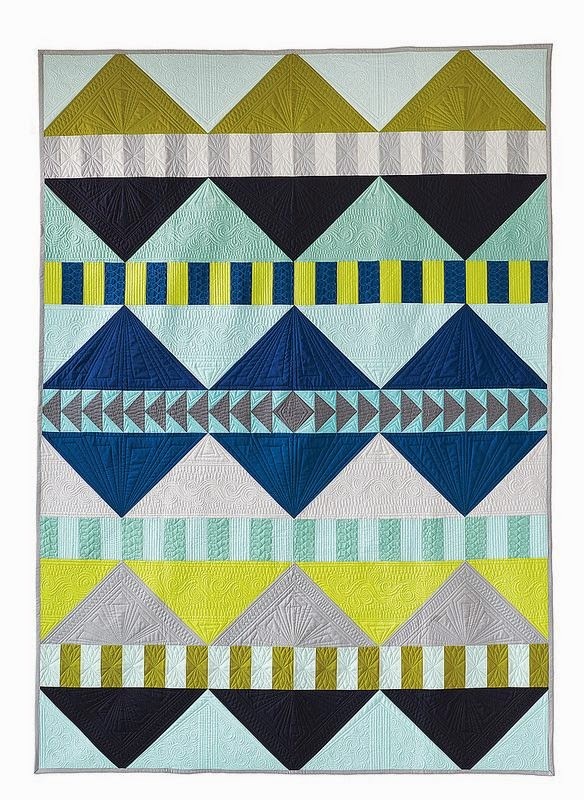 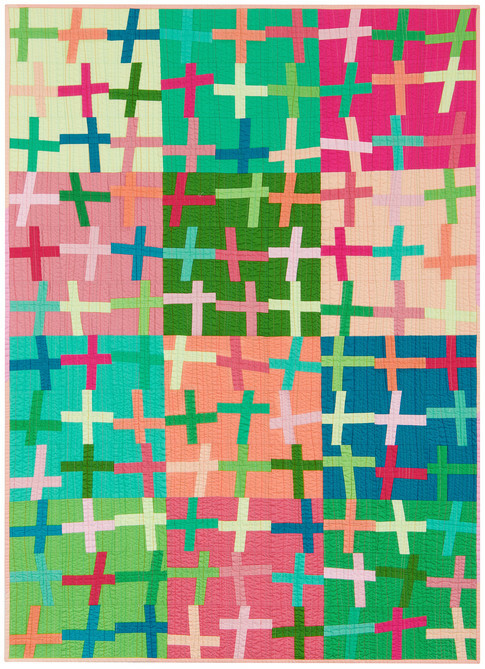 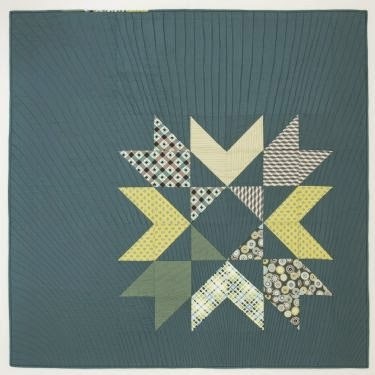 Inspired by a Drunkard's Path block, this totally modern quilt was derived from a block from the artist's quilt called Playing Well Together, designed for the Modern Quilts Unlimited Old is New challenge. 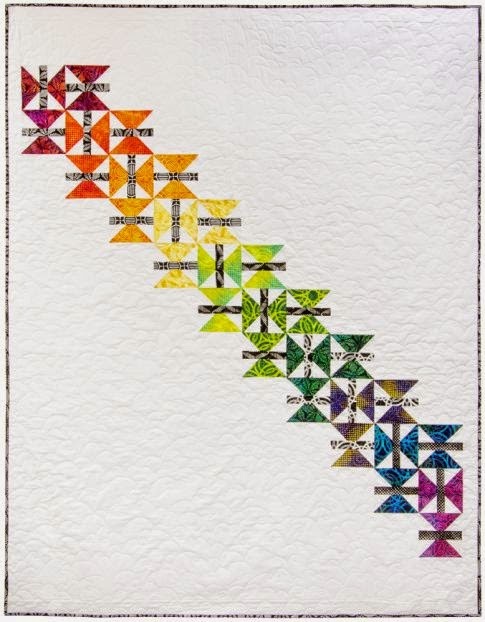 Ever larger Drunkard's Path sub-units extend out from the middle in four blocks. 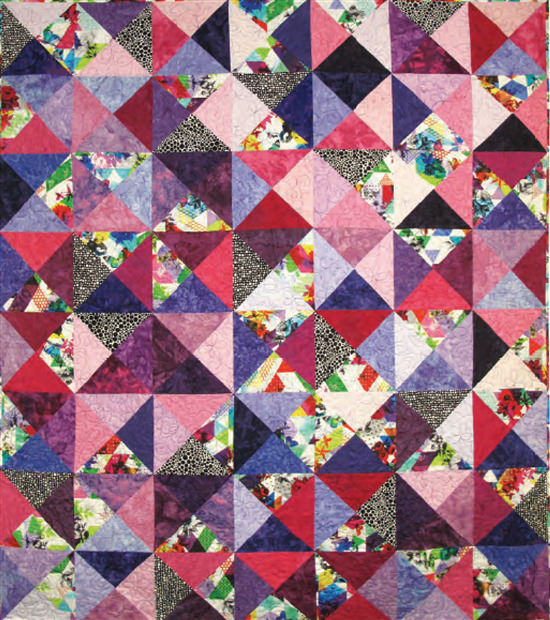 The purple unifies and contrasts with the other colors, giving luminosity and depth as the colors seem to jump out at you. 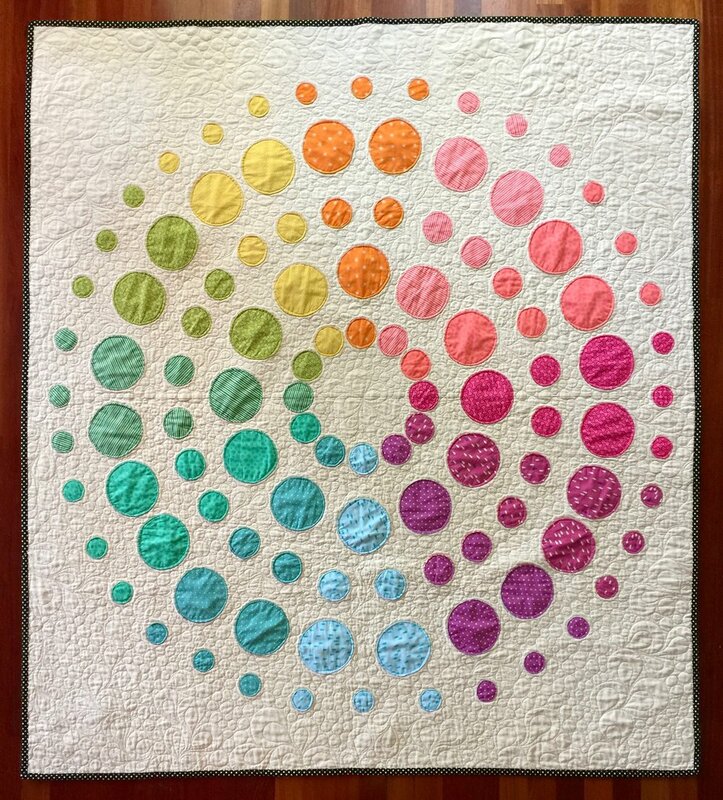 Drunkard's Bullseye was machine pieced and quilted by the artist. 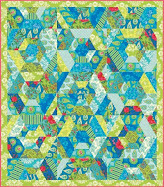 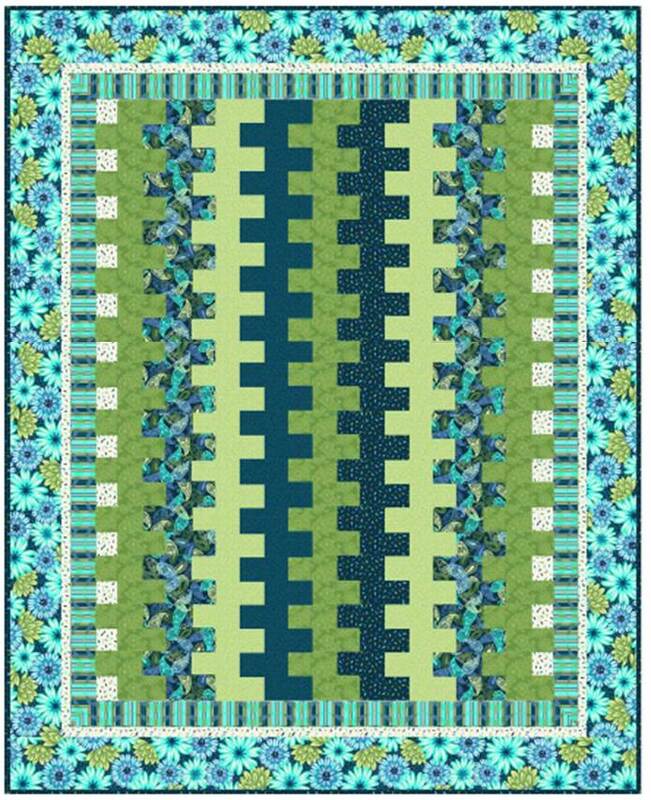 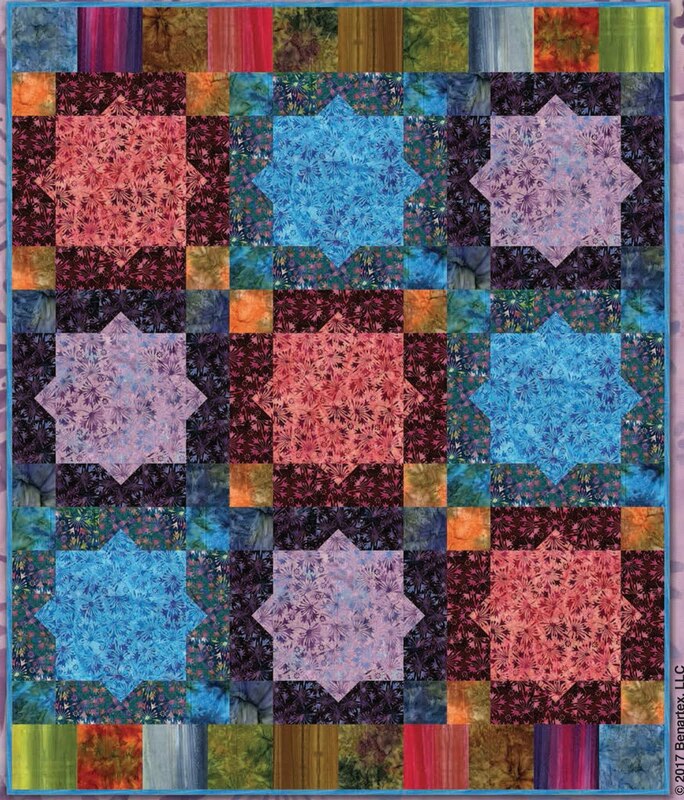 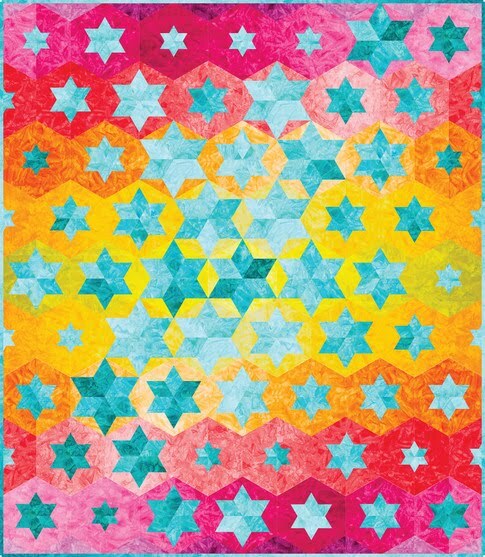 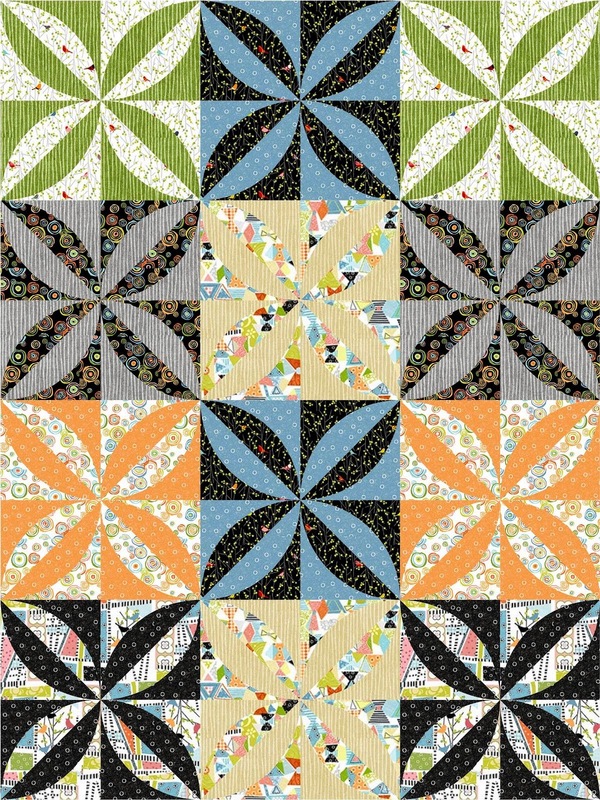 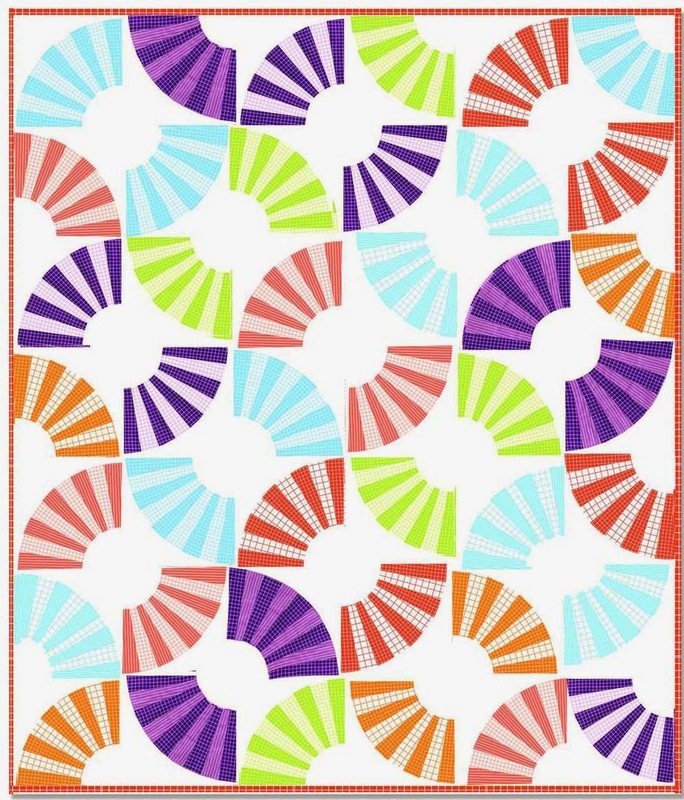 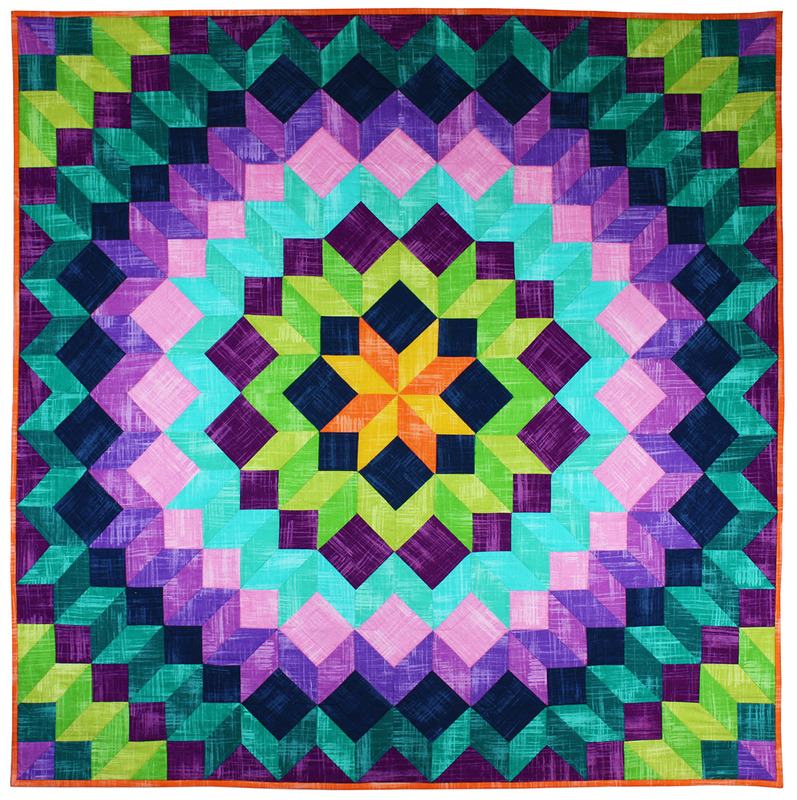 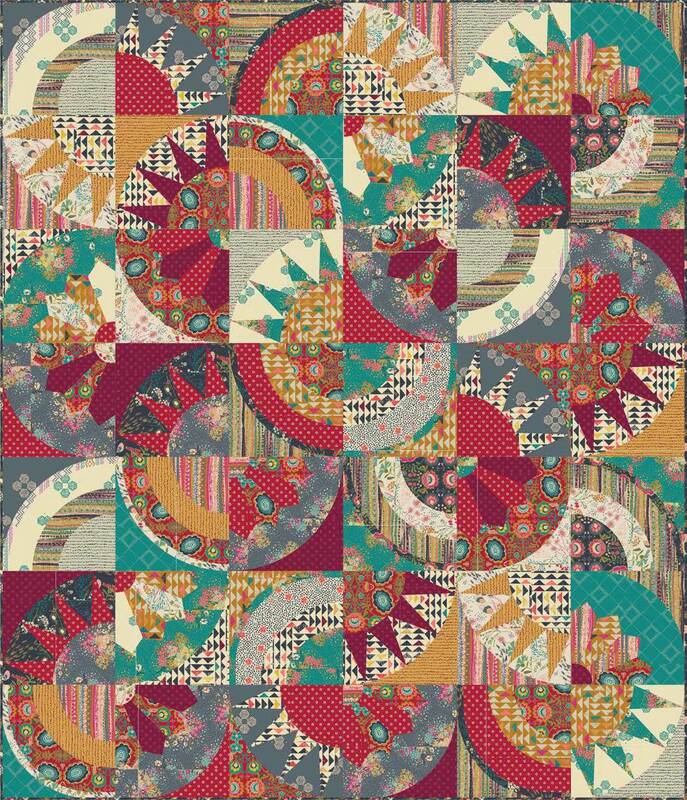 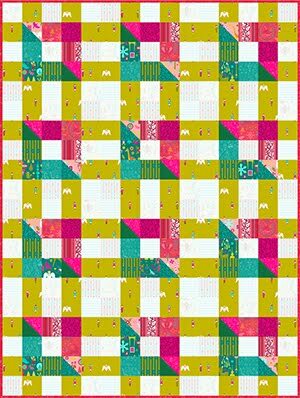 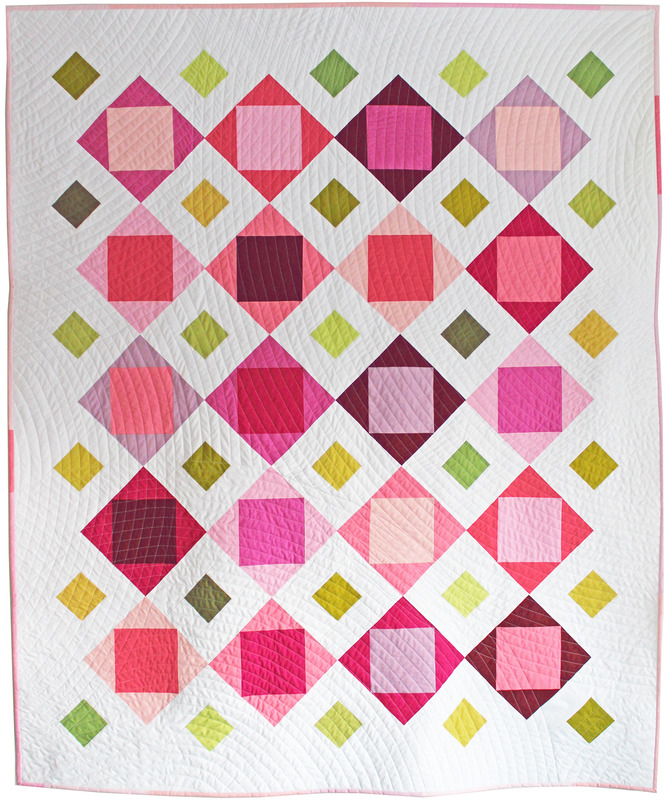 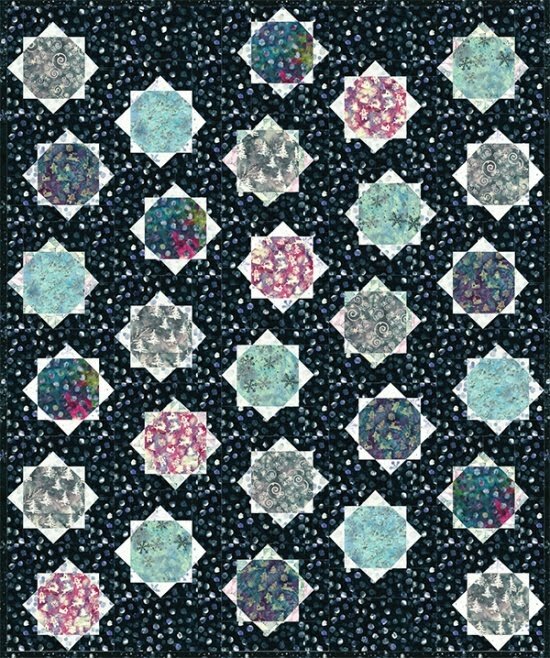 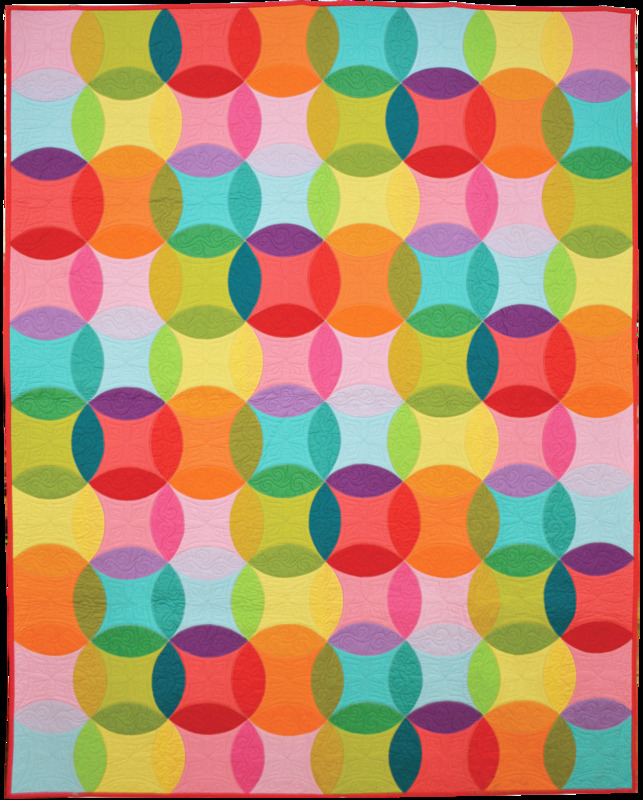 Christine Perrigo says that Ohio Snowball was inspired by Ohio Star and Flowering Snowball blocks (flowering snowball is a very pretty block with curved piecing). 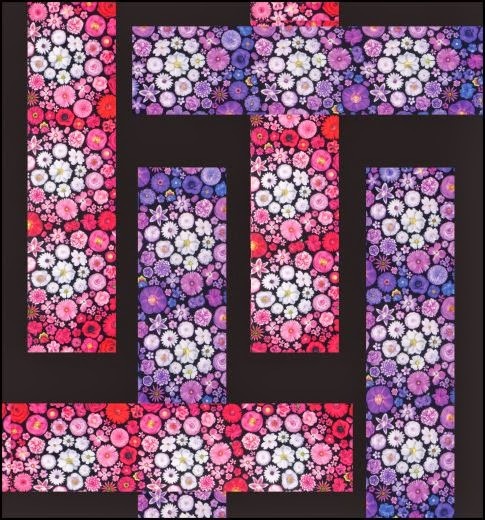 She started with a huge Flowering Snowball block, choosing to emphasize the small square formed between the petals. 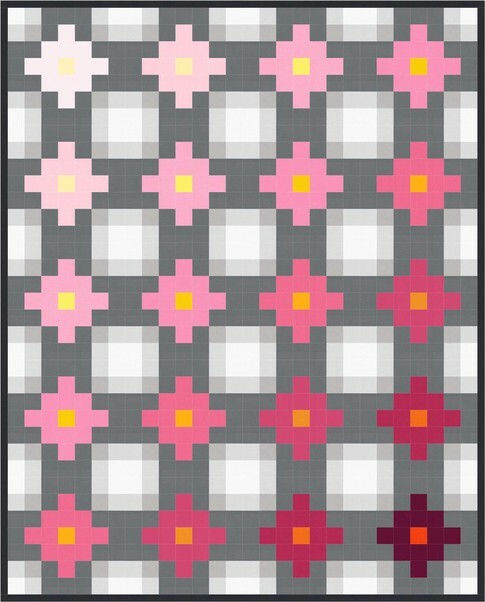 The Ohio Star blocks march across the different background segments in a grid. 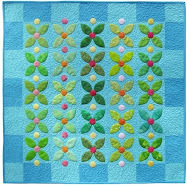 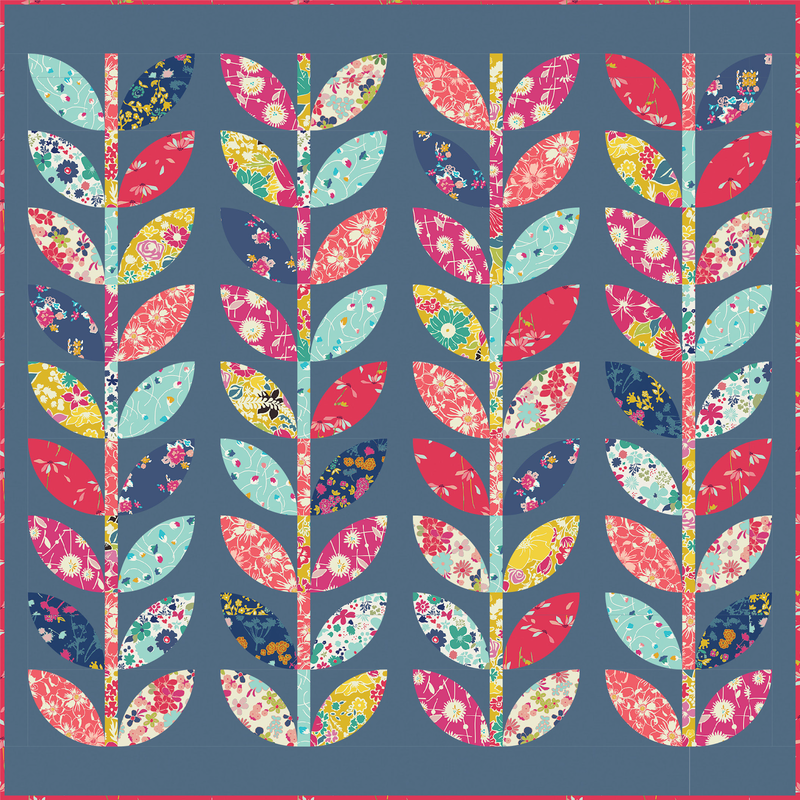 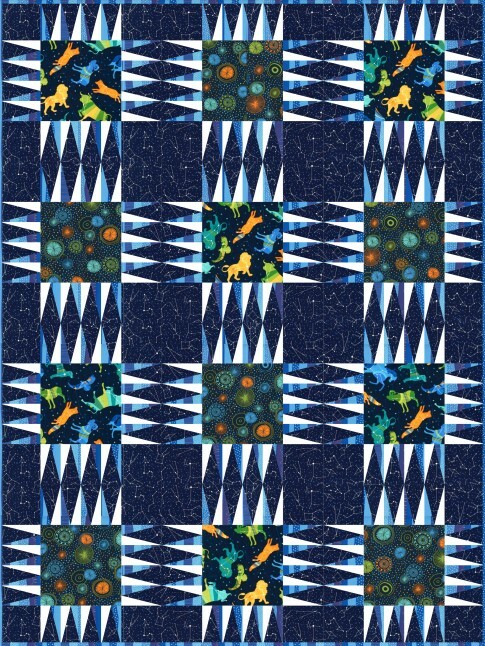 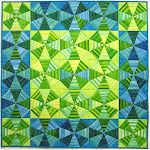 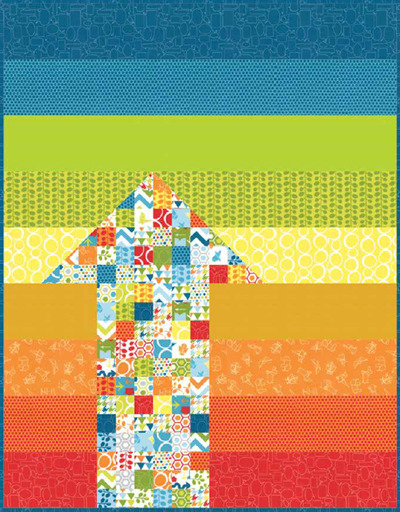 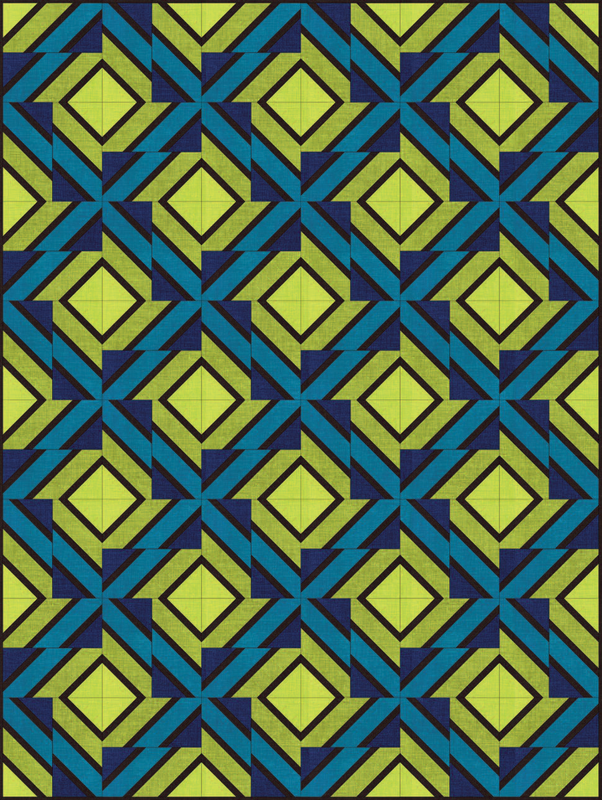 Christine says, "I very often play with overlapping patterns for my quilting designs. 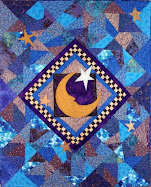 Once this quilt top was together, it sat for almost a year until I could brainstorm how to quilt it." 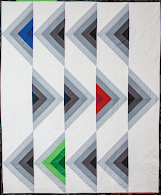 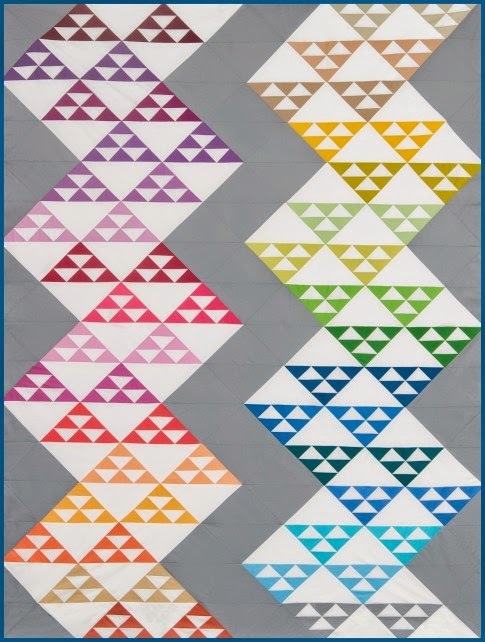 Sheila Bruner made this fantastic illusion quilt for her guild's Black & White With A Splash of Color challenge. 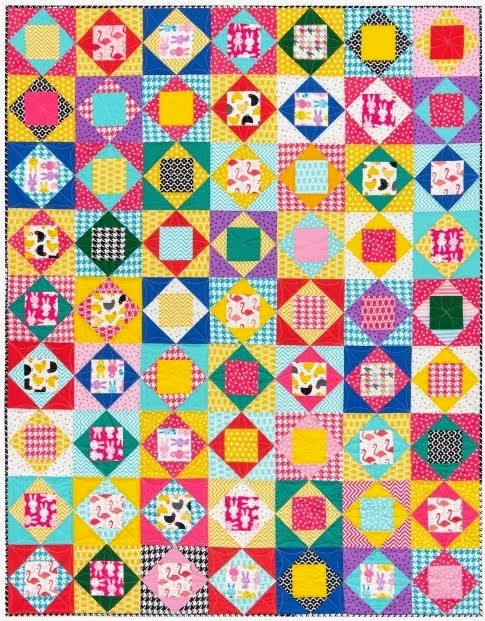 She says the piecing was quite a challenge! 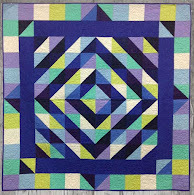 The tumbling blocks were made the hard way, with y-seams. 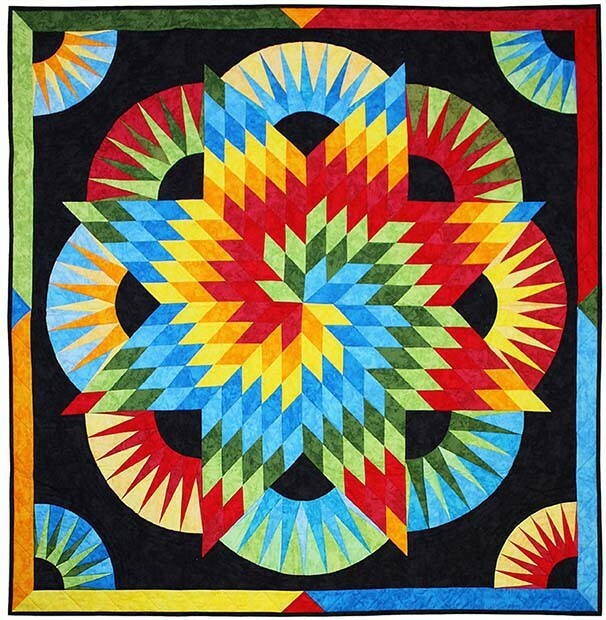 The quilting was done freehand on her longarm machine, with feathers and vines that loop in and out of the charcoal background. 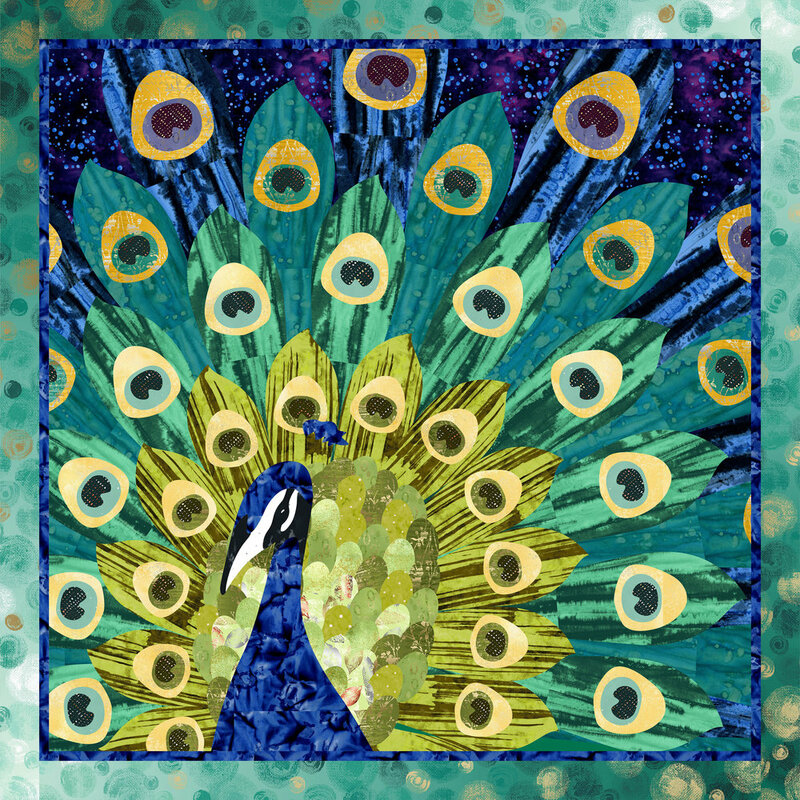 Sheila also used Derwent Inktense color pencils to enhance the 3D effect. 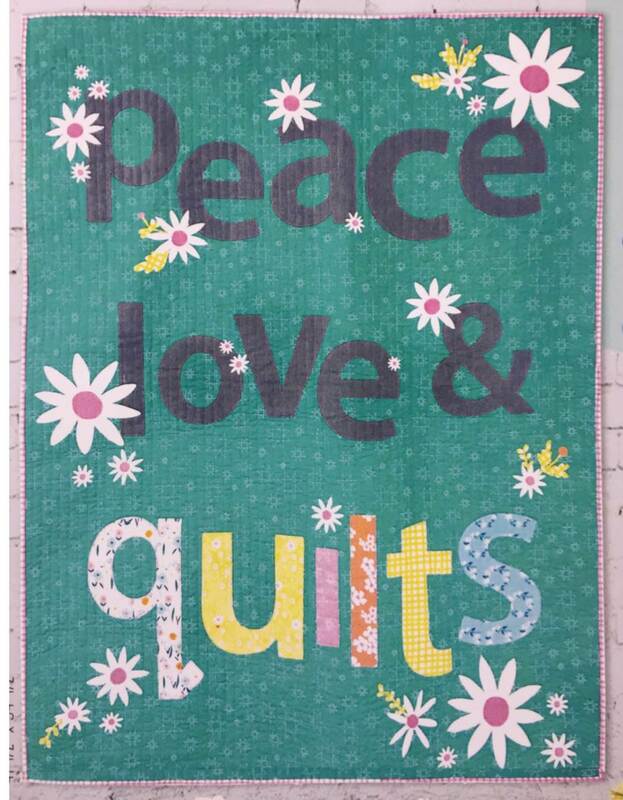 Image credits: Photos were taken by Quilt Inspiration at the 2018 Quilt Arizona show (Three D Illusion) and the 2017 Houston International Quilt Festival. 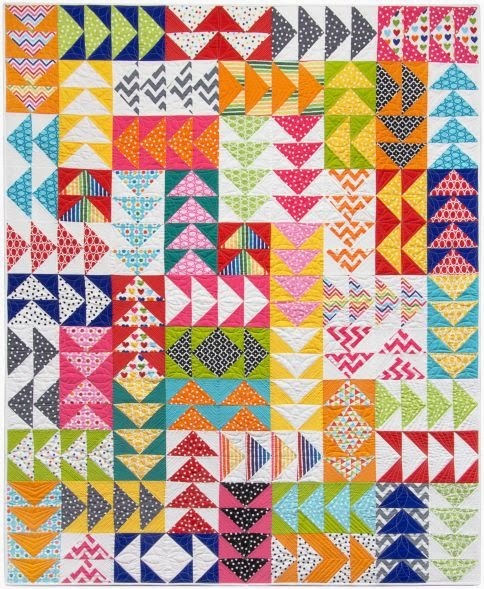 I love every one of these quilts. 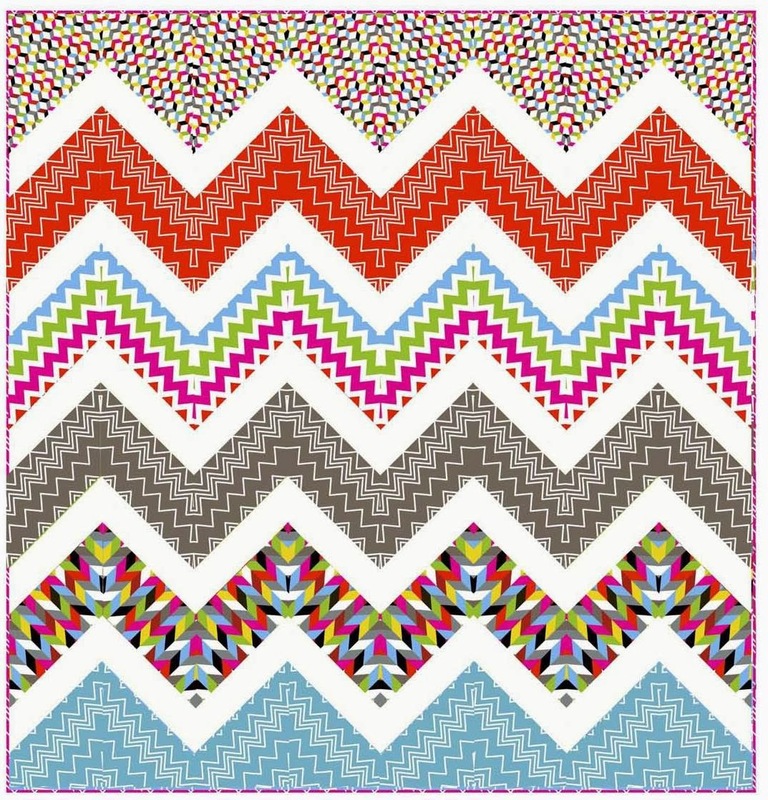 Modern are my fav. 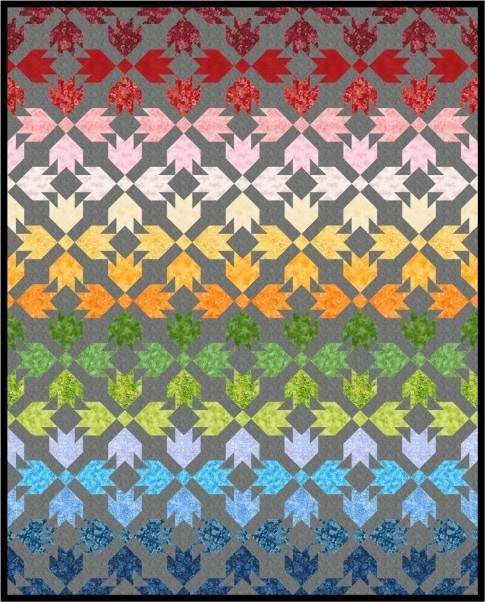 Wow.These are just fantastic and it's hard to choose only one fav.Thanks for.sharing pics!! 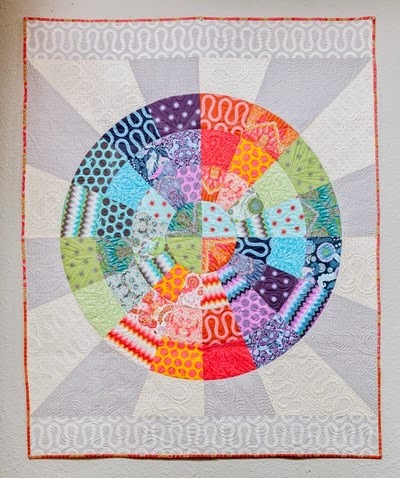 Thanks for including my quilt, Drunkarf’s Bullseye WOW! 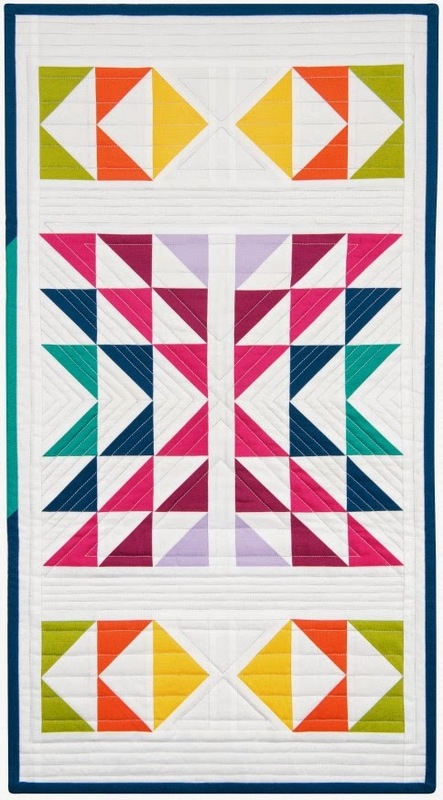 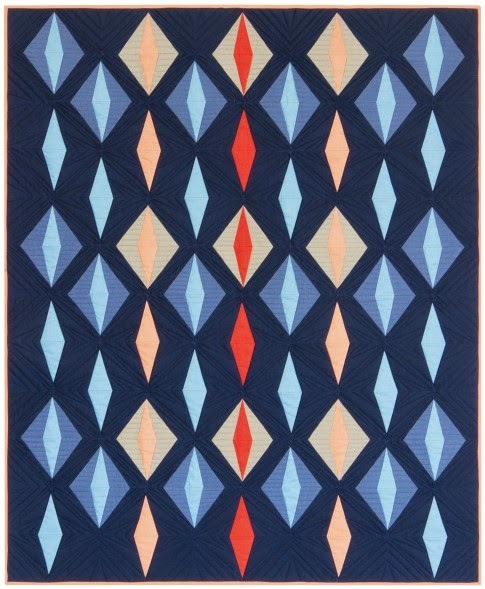 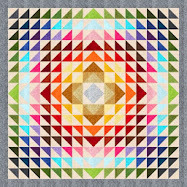 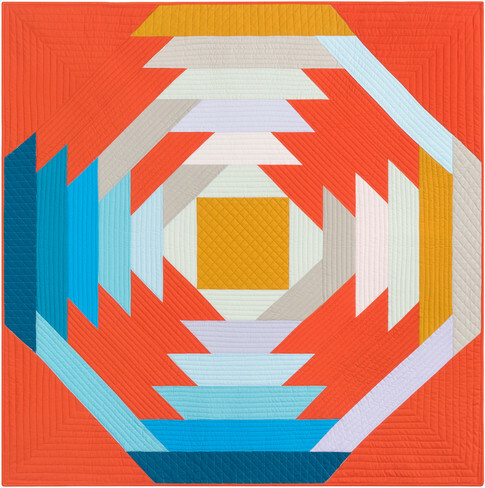 in your article about what makes a quilt modern. 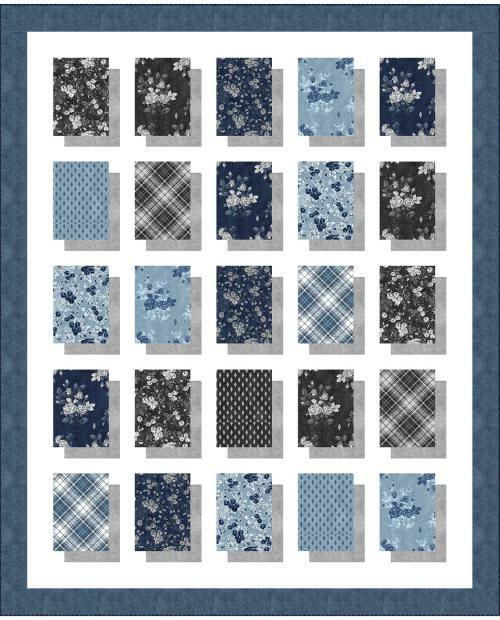 I’m honored!